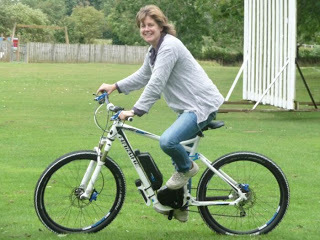 We’ve had great fun with our E-bikes. I’ve been lent a couple for the Summer holidays from Just E Bikes. One’s a mountain bike – Haibike – which my teenage boys like the best. And the other is a Koga, which I prefer because it’s more comfortable, although not quite as powerful. The bikes only give you power when you’re pedalling, so it’s nothing like riding a scooter. And you do get some exercise. Actually, it feels like you’ve got bionic legs. Going up hill is a breeze. The best thing about the bikes is that we’ve really used them – including for journeys when we would have gone by car. My sons have cycled to the station, to friend’s houses and to the shops. They’re quite fit, so they could easily have cycled without using the E-bikes but the truth is they wouldn’t have. My partner, Jamie, and I are the same. We’ve used the E-bikes much more than we would have if they didn’t have the extra power. And we’ve gone much further afield. Now for some of the technical details. The bikes can go for about 65km (about 40 miles) before they need to be re-charged – a bit less if there are lots of hills, as there are where I live. Apparently, it takes about 2 hours to fully re-charge them but we generally left them for several hours – or overnight – and the process is quite simple. The cost of re-charging works out at about £1 per 1500 miles. The bikes come with a small screen that you simply click on the handlebars to start the electrics working. You can ride them without getting any extra power, if you want to get more exercise – or on one of three settings, number three for full power. And the Koga has a little device on the handle bars to give you an extra boost when you need it – I found it rather useful. My main gripe with both bikes was that the screen information appeared to be a bit erratic. So if you wanted to get your average speed, trip time, range etc it didn’t appear to be accurate. This could easily have been because I never managed to work out the system. But if that’s the case, it needs to be simpler, because I like getting the stats! Sadly, our bikes have to be returned soon, so we have to think about whether we want to buy our own. That’s the biggest drawback. These bikes are not cheap. Over £2,000 each. Before you reel over in horror though, you should consider how much they might save you. For families with one parent working within 5 miles of home (22% of UK workers) – or even a bit further afield – an E-bike could actually replace a second car. Work out how much that would save in tax, insurance and fuel. And you’d be fitter and healthier too. You can get cheaper E-bikes, but the Dutch ones I’ve borrowed are good quality and should last a lifetime. So perhaps we shouldn’t be working out how much they are to buy, but how much they cost over 20 years. It’s a bit like buying an energy saving light bulb – the up-front costs are more but the actual cost over the life of the bulb is less. And let’s not forget that the bikes are a lot more fun than a light bulb! But we won’t be buying them for the children – they’ll have to get back onto normal bikes, or persuade us to lend them ours! This entry was posted in About me, Media & Communications, News 2011, Transport - Road, Rail & Air. Bookmark the permalink.